Please note that this site is temporarily under construction. Expect future changes. This site has not been developed as an all encompassing guide to backcountry travel and camping. 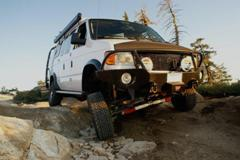 It’s up to the reader to understand the risks and danger of any off or on road travel as well as backcountry camping. At any time, weather, trail, or road conditions can change from what is written about on this site. Any person using this site as a guide to travel by must assume all risks, dangers, and liabilities that they might be subjected to. The author (or authors) and site owner disclaim any and all liability for any injury, loss or damage to you, your passengers or your equipment (including any vehicles which may be involved) that may incur. Have fun but play it safe and make sure you have the proper training before attempting any questionable off or on road travel. If you are like me, nothing is better than getting away from the daily grind of our industrial environment. Most of us look forward to a yearly vacation or even a simple weekend road trip to somewhere other than home. Even though some people live and work in pristine surroundings, exposure to new environments seems to be a natural pleasure to mankind. This site is designed as a travel guide for readers looking to explore a variety of regions I’ve had the pleasure of visiting and exploring over the past years. It might also be of value to those who have no means of access into the backcountry but love the beauty of our countries scenic wonders. Although I’m not a professional photographer, I do plan to have a photo section added to the site down the road. As far as the main blog, each post will include basic information about road conditions and requirements, seasonal weather, dispersed camping and/or campground information. A few of the entries will be somewhat personal in nature discussing my views about the surrounding area and the trip itself. Typically, each post will include several photographs to help readers visualize what to expect before a visit. At this time the site is under development and I am the only contributing author. This may change in the future provided site continues to expand. Besides the possibility of additional authors, upcoming plans include partitioning the site to offer a variety of specific sections other than the main blog. One section will be devoted to group four wheel drive runs; Trips with other off road vehicles or clubs. Another section will offer basic information to be used as a quick guide reference. It will be brief, to the point, and printer friendly without any images. Whether you are an arm chair adventurer, an avid off road enthusiast looking for a new trail to explore, or someone just out for a scenic drive, I hope this site will be helpful. Please respect the great outdoors our country has to offer by following all government rules, regulations, and restrictions. As stated at the beginning of this section, conditions can change frequently which can become a safety issue for drivers and passengers. Before attempting to tour any backcountry trails, learn the proper methods of 4×4 travel. Thanks for following Autoramblings Sportsmobile 4×4 Adventures.